I can’t install anymore APKs onto internal memory because I’m out of disk apk space. Yet, it says I have 500MB free space! What gives!?! Android sets aside 500MB of apk space as almost like a ‘temp’ folder for any work it has to do with installing APKs. When it gets to 500MB it simply stops because the android installer takes that 500mb for initializing installation of your apps. You will have to buy a USB thumb drive or remove some programs off of your Ouya in order to install again. From the main Ouya Menu, arrow down and click on Manage > System > Storage and if you have a USB stick you may have to arrow down with your ouya controller until you see the catagory for internal storage. On my Ouya I have 2.38GB available which is very good. I have moved all of my installed games off of my the internal memory of my Ouya and onto my USB Stick. I’m sure you’ll be asking how does one tell if a game is in your ouya internal memory or if it is on your USB stick? 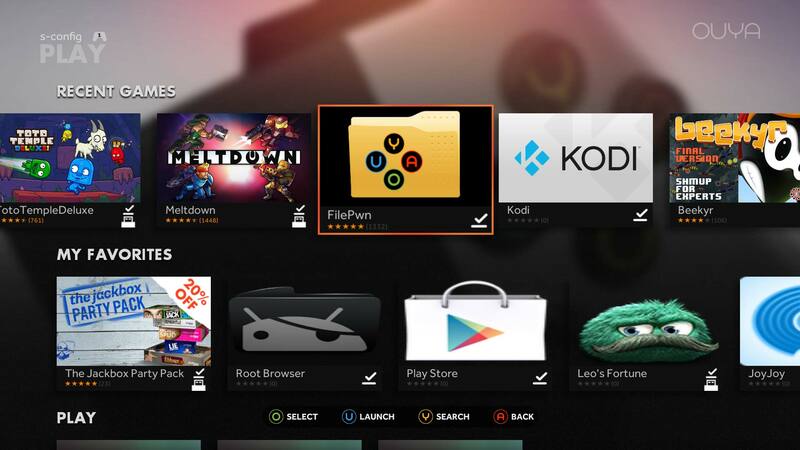 If you go into the Play section of your Ouya and look at each of the icons in the lower right-hand corner, you’ll see that some have a checkmark, while others on my screen have a check-mark with a computer icon. The ones with the computer icon are on my USB stick such as Meltdown or Toto Temple Deluxe. But FilePwn and Kodi are on my Ouyas internal memory. That means if I unplug my USB stick, I will temporarily loose access to my games but my two utilities will be fine. I will show you how to change with FilePwn. 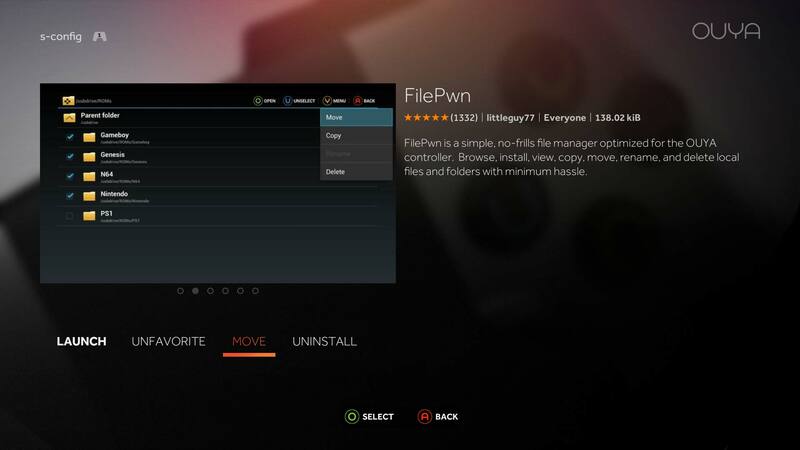 Select FilePwn by pressing the “O” Button on your Ouya Controller. Arrow over twice to the MOVE button and press the “O” button to activate it. If you USB Drive is inserted, it will give you the option to move this file off of your Ouya memory and onto your external USB drive. Arrow down to EXTERNAL HD and press the “O” Button to continue. Depending on the size of the file it may take anywhere from just a few seconds to almost 2 minutes. Be Patient. Once complete it will change change its icon in the play menu and from here on out it will launch the application off of your USB stick. Freeing your Ouya Memory. I think it’s always a good idea to get as much as humanly possible away from your Ouya’s internal memory as memory has only so many thousand read-write access points before it eventually goes bad. It’s better to replace just a USB thumbdrive then an entire Ouya.